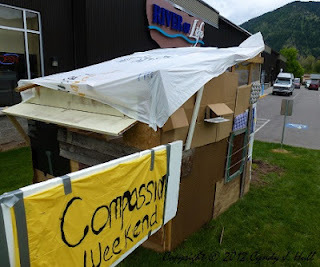 This past weekend, River of Life, in East Missoula, Montana, hosted our first Compassion Weekend to offer the opportunity of child sponsorship. To provide a life-size illustration of what families in many third-world countries call home, the Street Teams gang brought random materials and added their sweat equity to build this hut in front of River Side Coffee House. My favourite construction contribution: after being amazed to hear that many homes have dirt floors, one of our grade-schoolers grabbed a shovel & was a driving force to move a bunch of dirt inside. 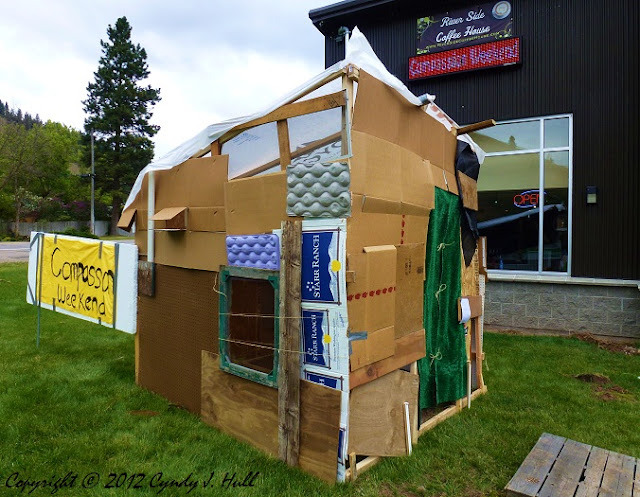 A bonus: on Sunday morning, three soggy cross-country bicyclists came in out of the cold, pouring rain - after parking their bikes in the hut! At this juncture of their Oregon-to-New York trek, Montana was killing them with unpredictable weather.